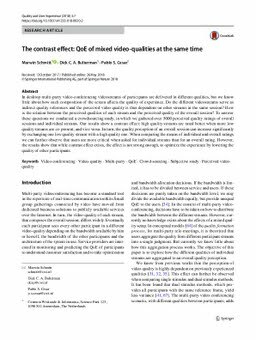 In desktop multi-party video-conferencing videostreams of participants are delivered in different qualities, but we know little about how such composition of the screen affects the quality of experience. Do the different videostreams serve as indirect quality references and the perceived video quality is thus dependent on other streams in the same session? How is the relation between the perceived qualities of each stream and the perceived quality of the overall session? To answer these questions we conducted a crowdsourcing study, in which we gathered over 5000 perceived quality ratings of overall sessions and individual streams. Our results show a contrast effect: high quality streams are rated better when more low quality streams are co-present, and vice versa. In turn, the quality perception of an overall session can increase significantly by exchanging one low quality stream with a high quality one. When comparing the means of individual and overall ratings we can further observe that users are more critical when asked for individual streams than for an overall rating. However, the results show that while contrast effect exists, the effect is not strong enough, to optimize the experience by lowering the quality of other participants. Schmitt, M.R, Bulterman, D.C.A, & Cesar Garcia, P.S. (2018). The contrast effect: QoE of mixed video-qualities at the same time. Quality and User Experience, 3.